Yukon NVMT Spartan 1x24 Goggle Kit: Turn your Yukon NVMT Spartan 1x24 into a hands-free monocular with Yukon's NVMT Goggle Kit. The NVMT 1x24 Goggle Kit shaped after military-tested designs that provides hours of relaxed hands-free operation, ideal for modern Ranger games & night hiking. This kit comes with a NVMT (1x24) monocular and a head mount to turn your NVMT into a hands-free monocular. The low magnification of NVMT (1x24) avoids distance distortion and relaxed viewing, while working. This reasonably priced, compact, lightweight monocular provides comfortable viewing and versatility for many activities. 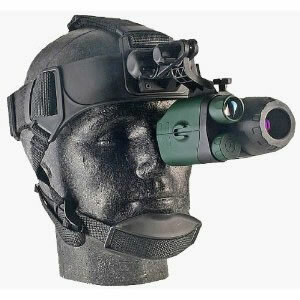 Yukon NVMT Spartan 1x24 Goggle Kit is great for the outdoor enthusiast to take it to sporting event, hunt and hiking. The Yukon's special PULSE system Infrared (IR) Illuminator offer infrared lighting for better image. The PULSE system utilizes rapid IR energy bursts to penetrate further to increase distance, visibility and image quality, without battery drainage or untimely IR burnout. The ergonomically designed, tough, RUBBER ARMOUR body protects the Yukon NVMT Spartan 1x24 from dust, dirt, moisture. It's great for hiking, traveling and prolonged use. Turn your Yukon NVMT Spartan 1x24 into a hands-free monocular with Yukon's NVMT Goggle Kit. The NVMT 1x24 Goggle Kit shaped after military-tested designs that provides hours of relaxed hands-free operation, ideal for modern Ranger games & night hiking. This kit comes with a NVMT (1x24) monocular and a head mount to turn your NVMT into a hands-free monocular. The low magnification of NVMT (1x24) avoids distance distortion and relaxed viewing, while working. This reasonably priced, compact, lightweight monocular provides comfortable viewing and versatility for many activities. Short-range Infrared (IR) illuminator for use in very low light/total darkness - Twin tripod sockets are built-in - High grade Gen 1 Image Intensifier Tube (IIT) - Hands-free, walkabout operation - Tripod Socket 1/4" - Can be used for night photography (Accessories Needed) - Low power consumption - NVMT Spartan 1x24 give 1.0x image magnification and 30° field of view - Head mount allows adjustment of the device in multiple directions.